If you are going to fight zombies a little physics helps. Actually it can help a lot. After trying to understand a bit more about kinetic energy I bought this book in the hope it might explain things better. It does and without too much maths with is great for people like me. Jason Thalken has a PHD in physics and a black belt or two in martial arts. 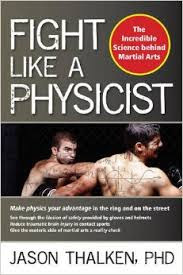 So he has put the two together and written a book on the science of fighting. There are some valuable tips, like the difference between momentum (which is great for shoving zombies out of the way) and kinetic energy (which is great for whacking their heads in). Or why understanding pi can make you punch faster. Thalken also presents some interesting US statistics around self defense. Turns out people who immediately attacked their attacker in self defense suffered the least injuries. Seems the best defense is an offense. So don't let the zombies get the upper hand, or your brain. Attack first. At the end of the book Thalken explains some of those mystical superpowers that you hear about. How to lie on a bed of nails or bend a spear with your throat. Looks like being a mystical monk is all down to knowing your physics. Sadly the book was very light on weapons but did show where the center of gravity on a baby is. Could be useful one day. Finally a book that helps put all those boring physics classes you did at school into practical use.